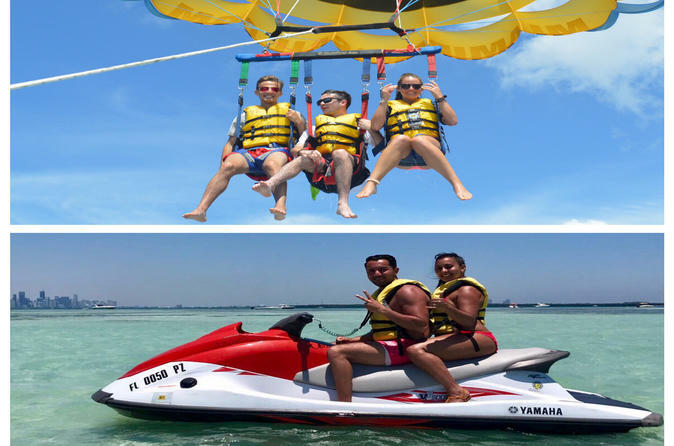 Hello Miami - Parasailing and Jet Ski Best Combo Package with Miami Watersports! Enjoy an the best Miami Watersports combo! Start of with a unique Parasailing flight, to then jump on a guided Jet Ski ride zone! You will fly be Flying 400ft over the water on our smiley face Parachute; at that height you can be sure to spot all of the sea turtles and dolphins swimming in the area as well as the breathtaking view of the Miami Skyline. You will also received the option of getting dipped into the water, or simply land back on the boat staying dry. We can fit up to 3 flyers per flight, with a total capacity of 12 passengers on our Parasail boat. Our Professional guides will make sure you receive an everlasting Jet Ski experience! We will be riding out on brand new 2018 Yamaha vx Jet Ski to a unique ride zone area with clear shallow water.